LANGLEY — If you were at the Langley Events Centre last March, you got a chance to witness just how ever-evolving and fluid the state of a high school basketball team really is. The Burnaby South Rebels, after their 80-72 win over the Semiahmoo Totems, won the B.C. senior AAAA basketball championship title just over two weeks after winning a Lower Mainland sudden-elimination game just to get to The Big Dance. And as a new season of high school basketball tips off in our province, it’s time to start wondering all over again, just who that might next champion might be? 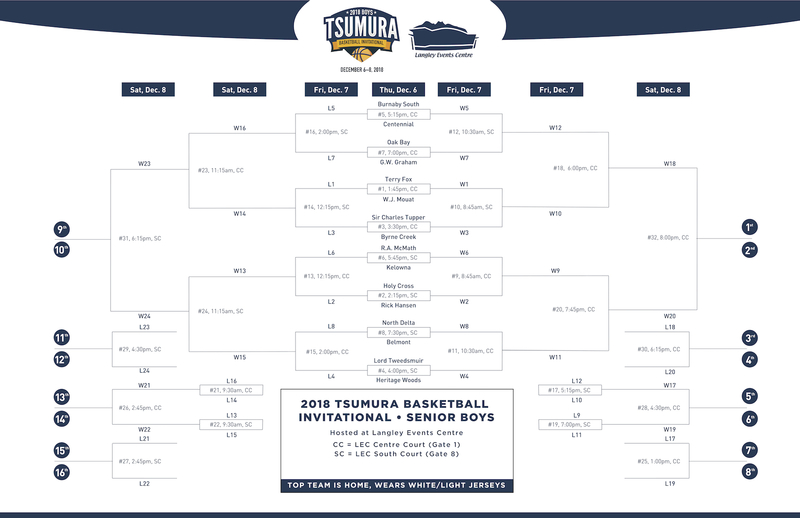 That’s why we hope you’ll find your way back to the LEC Dec. 6-8 for the annual 16-team Tsumura Basketball Invitational. The Rebels, B.C.’s preseason AAAA No 1, are there, as are the AAA preseason No. 1 North Delta Huskies. Take a look at the draw included below, map out your schedule, and get ready to re-immerse yourself into our grand game!